There is a lot going on in the world of environmental action, but we aren’t hearing much about it. Part of the reason is because there is a bizarrely entertaining presidential campaign going on. Part of it is because people seem to be relatively uninterested in environmental concerns. The main reason may be that there is a lot of money, power, and influence that does not want the general populace to be environmentally active. That would get in the way of making money by continuing the ruinous practices that are truly an existential threat to life on Earth as we know it. I will grant that mass media have been covering one environmental issue. We’ve seen it on broadcast-network evening news shows and read about it in nationally-syndicated news articles. What is it? Why, the outrageous destruction of a beloved rock formation in Oregon by a group of thoughtless, arrogant vandals. I do not mean to diminish this event, both because this sort of thing happens far too often and because it is emblematic of humanity’s urge to dominate nature and do with it as we please. However, in terms of impact on life, human health, and the environment it is small potatoes. There are several other issues so significant that they make rock-toppling the equivalent of a fart in a hurricane. So let us catch up on what’s going on in the rest of the environmental arena, because you probably have heard little, if anything, about it. Members of the Standing Rock Sioux (Lakota) tribe have been demonstrating since April to block construction of a crude oil pipeline within one mile of their reservation. They and others (mostly from other indigenous American tribes) who have joined them have held up construction of the pipeline – which would carry over half a million barrels of crude daily – by demonstrating, picketing, and obstructing earth-moving machinery, as well as taking legal action in the courts. The United Nations is on their side. 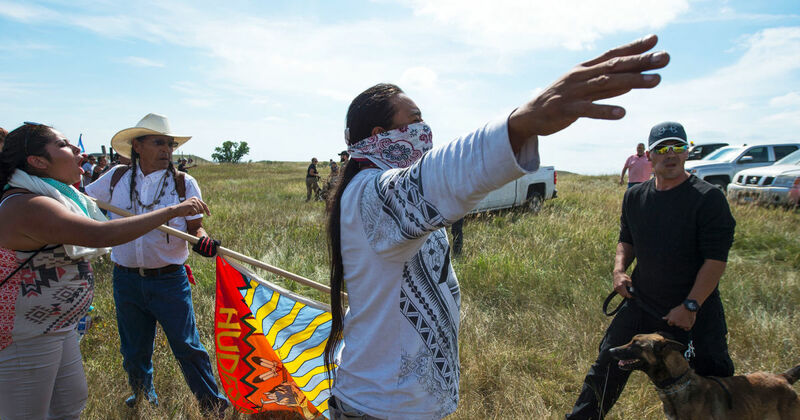 The issue is both cultural and environmental (the pipeline threatens burial grounds and other sacred sites as well as surface water sources, aquifers, land areas, and wildlife habitat), and the protesters have been forceful and firm. The situation has dredged up memories of company goons trying to break organized labor actions 80 or 100 years ago, as construction workers and private “security companies” hired by the pipeline partners have attacked protesters with dogs and pepper spray. Chances are you haven’t been told much about what’s going on at Standing Rock. A good place to start would be by clicking here. In a previous post, I commented on the frightening rise in the number of earthquakes in the formerly almost quakeless State of Oklahoma. The massive increase in earthquakes there is readily attributable to the concomitant increase in the use hydraulic fracturing (a/k/a “fracking”) to obtain oil and natural gas and to deep-well injection to dispose of wastewater produced by fracking. The State of Oklahoma had given orders to its Geological Survey units to report no connection between fracking and earthquakes, despite findings to the contrary by the United States Geological Survey and by most seismologists. On September 3, 2016, Oklahoma experienced its largest earthquake ever – magnitude 5.8, felt from South Dakota to Texas – and now is as earthquake-prone as California. The State of Oklahoma has tacitly admitted the causal relationship between fracking and earthquakes, since for a year it has been more closely regulating disposal wells associated with fracking. It is not the fracking itself that causes these earthquakes, but they are a direct result. Fracking brings up not only oil and gas, but also brine and other contaminated waters. Current practice is to dispose of this wastewater by high-pressure injection into porous deep (around 7000 feet below the surface) rock strata. The strata lie above a firmer layer containing numerous closed faults, and the pressure from injection forces the wastewater into the faults, pushing them apart. The result is subterranean slippage which would otherwise be unlikely to occur for hundreds or thousands of years. After the September 3rd quake, the State ordered the closure of 37 injection disposal wells in a 725-square mile area, which certainly underscores its acknowledgement of what it so long denied. You can find statistics and keep track here. Perhaps now more attention will be paid to the fracking activities of the energy businesses. Regular readers of my blog are familiar with my inspiring friend Xiuhtezcatl Martinez. In addition to his many speaking engagements, television talk-show appearances, and performances, young Mr. Martinez is one of 21 plaintiffs in a year-old lawsuit. With the assistance of prominent climate-change scientist Dr. James Hansen, he and the rest of the group of young people filed a suit against the United States government to compel action to guarantee their right to a stable and sustainable future by mitigating the effects of climate change. The case, Juliana, et al., v. United States, was directed against President Barack Obama, cabinet members, and numerous Federal agencies. These defendants have been joined by three lobbying and PR groups representing the fossil-fuel industry. Together they filed motions to dismiss the young people’s case. In April, 2016, United States Magistrate Judge Thomas Coffin denied all the dismissal motions and set the case to proceed. In a standard delaying tactic, the defendants appealed the dismissals by objecting to Coffin’s ruling and taking the case to another court. This coming Tuesday, September 13, U.S. District Judge Ann Aiken will begin hearing oral arguments regarding the defendants’ objections to the April ruling. It is another step in a long and uncertain process that aiming to compel the U.S. government to do its job of ensuring a safe, healthy, and stable future which will, in the words of the Preamble to the Constitution, “Secure the blessings of liberty to ourselves and our posterity.” The emphasis in the preceding sentence is mine, because I want to underscore the importance of the idea that the United States of America was founded with more than present generations in mind. Our nation was created to be forward-looking. We are called to seek constant improvement without demeaning or destroying our future. It is up to us, living today, to ensure that we do not squander the past to cushion the present at the expense of our children’s – and our children’s children’s children’s – future. The time for us to pay it forward is now. If not now, when? If not us, who?